Hello smokers! how about a way to eat your cake and keep it too? Yes, there is a way for those smokers who really want to quit smoking and at the same time can't get over the habit of dragging in that hazardous smoke. 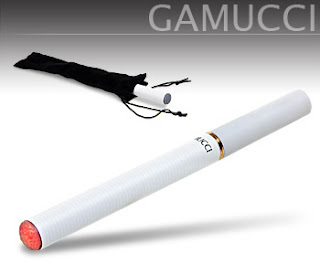 Well thanks to the Gamucci Micro Electronic Cigarette, now all of you smokers can have your way. They claim that it tastes like a cigarette. Since I never tried it, I am not sure. But if tastes like one and is absolutely free of all the negative effects that a tobacco brings then I would definitely give it a try. "No flame, no tobacco, no carcinogens, and unaffected by the smoking ban" is what the makers claim. To give the smokers a real feeling simulated smoke is emitted as you exhale. This is only vapour and evaporates in seconds. This is made possible because of a state of the art micro-electronic technology (they don't say exactly what it is) and a tiny battery vapourises liquid inside the cigarette producing smoke. By inserting cartridges that releases nicotine one can get the real feeling or one can choose to skip the nicotine altogether and just puff away on what is virtually nothing. Now if you are really excited and wanna read more, check it out here. I've seen this on the TV a while back and with the introduction of the new micro version of the Gamucci, I thought i would give it a try to see if it could help me at least be healthier if i was to 'smoke'. So I found it and bought it from prezzy box and i dont miss the nicotine or cigarettes anymore and whats more i dont miss getting wet outside when it is raining!